I'll let you into a little secret. Although the idea of 'school streets' seems radical, the legislation allowing us to deliver them has been around for decades. The term 'school street' is not some kind of legal term, it's a marketing idea designed to win hearts and minds. If that what it takes, then fine, but the mundane fact of the matter is we are using traffic engineering tools to protect children from drivers and rolling out the concept has to be applauded because as ever, it demonstrates that asking people to play nicely doesn't work and that infrastructure is generally the answer. 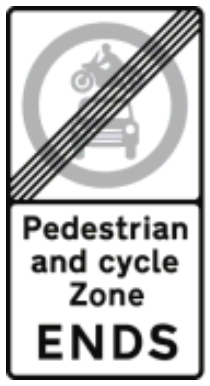 The 'pedestrian and cycle zone' wording and the red circle with the motor car and motorcycle is a basic requirement. It means that the way ahead is only for people walking and cycling; and we want the latter because we want kids cycling to school. Next we have the times of operation. This is going to be Monday to Friday for the main part and the times are going to straddle the start and end of the school day. I'll come back to this in a minute. Exceptions can include blue badge holders, loading, permit holders, buses and taxis. Blue badge holders might be exempted, especially is there are pupils being driven to school or a member of school staff needing assistance, although it may be that the member of staff arrives before the restriction starts. We don't want loading or taxi access at all in my view, although bus access might be needed. The "at any time" plate at the bottom essentially explains that beyond the entry point, there is no parking or waiting to take place - in essence it's a signed version of a double yellow line. This can be varied to a part time control and in all cases, repeater signs are needed. If there is a general problem with parking, then this can be a useful (and tidy) addition. Of course, as this operates on a zonal basis, we can include as many streets as we like. 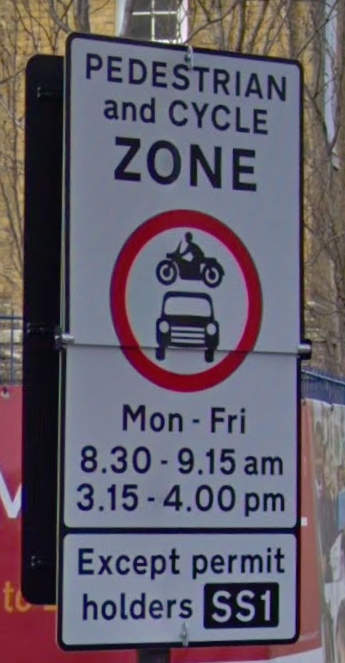 "the Zone Ends sign is important to warn people inside the Zone that they are passing the end of the restricted area and should be aware of "normal" road conditions past the sign especially if the street design is identical." Camera enforcement. Using automatic number plate recognition (ANPR), those driving into the zone will be detected and a fine issued by the traffic authority. Fixed cameras can cost £15k-20k each to procure and install and they need power, communications and a 'back office' to process the fine. CCTV cars are the other way to deal with the enforcement and so they could be deployed randomly as part of general tasking. Removable/ foldable bollards or gates can be used to physically prevent motor traffic accessing the zone. This requires somebody to physically deal with the bollards and gates. If the zone has a morning and afternoon restriction, then this means the closure is attended to four times. With the physical approach, the easiest way to manage this would be by putting a formal agreement in place with the school, so they can deal with the process. Because we are also probably only going to run such a scheme during term time, it would also make sense to enlist the school's help to change the signs at the start and end of term as well. If we don't do this, then the restriction would apply during the school holidays. This might actually be fine, but if residents or business are affected, then we may want to take them into account during holidays. You can see that the top half of the sign folds down to cover the bottom half and there are toggle locks to hold it in place. 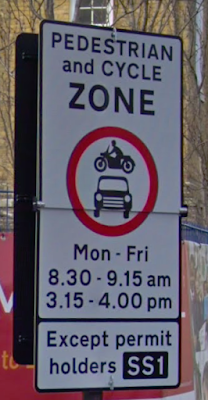 In this example, the restriction applies for 45 minutes in the morning and the afternoon and people with the correct permit are exempt (this could be residents or businesses). In fact, Hackney has quite a nice scheme explainer and details on it's website as does Edinburgh. How such a scheme is established is up to you. A permanent scheme requires the usual public consultation, traffic order and decision-making process. Alternatively, an experimental traffic order could be used which allows a live scheme to be part of the consultation process. Either way, it is likely to need a decent level of public engagement because in essence, we are telling people they cannot drive somewhere. A permit system perhaps reduces the pain for residents and if their street is usually blocked at school times, they may welcome it. Care needs to be taken that the problems in the streets by the school don't just get pushed a bit further out with unintended results being the issue. However, given that it only takes a few parents to increase the risk exposure to many children, then it's a welcome use of one of our traffic management tools. If we make driving kids to school harder, some who are making the short trips will give up and walk (or cycle). I acknowledge that some people drop their kids off as part of their journey to work or elsewhere, but that doesn't give them licence to park next to the school or put everyone else at risk. They'll have to change. Just one little niggle.... I think you will find that the legislation allowing CCTV enforcement does not apply outside London. I've been told camera enforcement is limited to London at the moment. Does anyone know any different?